get more”. He said he bought another £18,000 worth of alcohol. I want to drive the f**kers [protesters] into the sea. The jury was told that Mr Rooney made a statement about the incident to Terry Nolan, the then CEO of Shell E&P Ireland, in Shell’s offices in Bangor Erris. “He wrote the statement and I signed it. I was accurate and truthful in the statement,” he said. However, Mr Rooney claims that on 21 September 2007, he was in Dublin airport when he received a call from Mr Nolan, who told him that he needed to change the statement. He claimed that Mr Nolan said the Gardaí authorities would ‘nail Joe Gannon to the cross’ for what he had said about the protesters, and that ‘he is our man, who needs protecting at all costs’. Mr Rooney said that he refused to comply, and that his company’s relationship with Shell ‘deteriorated rapidly’ afterwards. Last year, a Garda Síochána Ombudsman Commission (GSOC) investigation into allegations found ‘[no] evidence of the purchase or delivery of alcohol to Garda stations, nor of any misconduct of Garda members’. Supt Thomas Murphy was also appointed to investigate the allegations, and Mr Kane told the jury that both he and Mr Rooney met him in a hotel in Tallaght and spoke to him for a number of hours. Mr Kane also claimed he met with Johan Groenewald, an official from GSOC, who investigated the allegations. He claimed Mr Groenewald told him the investigation was ‘a f***ing joke’. Mr Kane said they fell out with Shell as a result, and that the refusal to change the statement had ‘cost us our livelihood’. He said all deliveries to Belmullet Garda Station were done in unmarked vehicles, and the receipts for the alcohol were destroyed. Patrick Reynolds (prosecuting BL) chose not to cross-examine Mr Kane and Mr Rooney’s evidence, as he deemed it irrelevant to the case. Judge Petria McDonnell ordered the jury to disregard the evidence when deliberating on their verdicts. In a statement regarding the allegations made by Mr Kane and Mr Rooney in court, Shell stated that there was no substance to the allegations. “These allegations have been ongoing since 2010. Over the last five years Shell has taken the allegations very seriously. Three investigations, both internal and external have taken place. 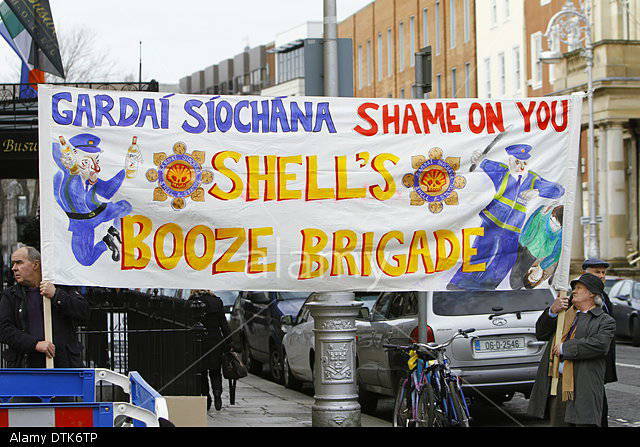 Shell welcomes the findings of the investigations by An Garda Síochána and GSOC, which concluded that that there was no substance to the allegations,” the statement read.